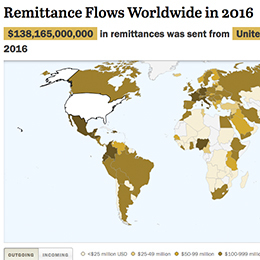 Remittance flows decreased worldwide for a second consecutive year in 2016, the first back-to-back decline in over three decades, according to recently released data from the World Bank. Remittances to Latin America and the Caribbean, however, rose to a record high. Globally, migrants sent an estimated $574 billion to their home countries in 2016, a 1.4% drop from 2015. But in Latin America and the Caribbean – together making up a region where many people say economic conditions are bad – remittances rose to $74.3 billion, a 7.4% increase from the previous year ($69.2 billion). Europe was the only other region in the world to see an increase, and it was a much smaller one (up 0.9%). View our updated interactive to see the estimated inflows and outflows of money sent by migrants around the world in 2016. 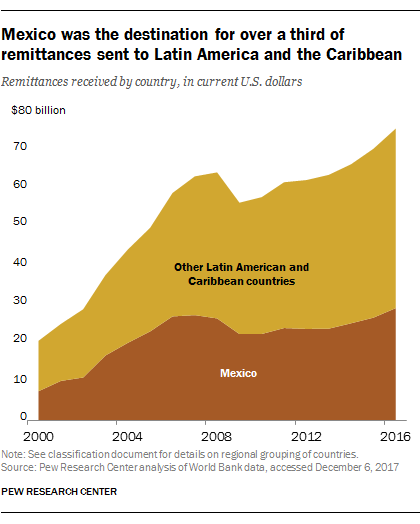 Most of the remittance dollars flowing to Latin America come from the U.S., which is home to two-thirds of all migrants from Latin America and the Caribbean. (For migrants from Mexico, El Salvador, Guatemala and Honduras, this share is far higher – more than 80% of migrants from each of these countries live in the U.S., according to 2017 United Nations estimates.) 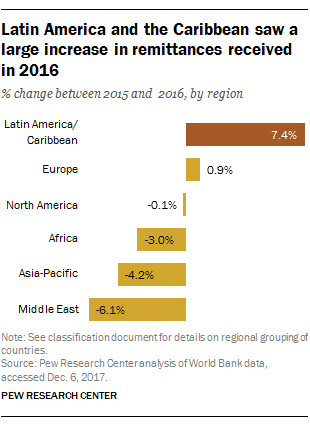 The number of immigrants from Latin America living in the U.S. continues to increase, though growth is modest and most new arrivals are from Central America and not Mexico. The increase in remittances to the region is primarily due to general improved labor market conditions in the U.S., which has helped boost Latin American migrants’ capacity to send money home. This improvement was especially evident in sectors such as information, construction and manufacturing, industries in which many Latin American immigrants work. 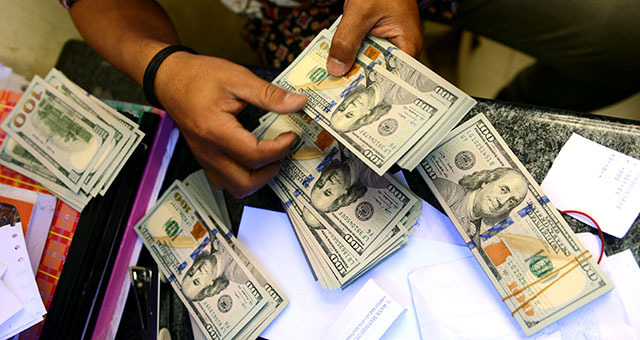 A strong U.S. dollar, coupled with the depreciation of most currencies in Latin America, was another factor behind the increase in remittance flows to the region, according to the World Bank. In Mexico, for example, the U.S. dollar appreciated against the Mexican peso by 17.7% from 2015 to 2016, which resulted in remittances (sent in U.S. dollars) having stronger purchasing power there. Among Latin American and Caribbean countries, Mexico has long received the highest amount of remittances. In 2016, $28.6 billion in remittances flowed to Mexico (up 9.3% from the previous year) – a total that accounted for over a third of remittances to all of Latin America and the Caribbean. After Mexico, Guatemala ($7.5 billion), the Dominican Republic ($5.5 billion) and Colombia ($4.9 billion) received the highest amounts of remittances in the Latin America and Caribbean region in 2016. Worldwide, Mexico ranks fourth in remittances sent by migrants, behind India ($62.7 billion), China ($61.0 billion) and the Philippines ($31.1 billion). Together, these four countries accounted for almost a third of all remittances sent in 2016. As a share of total economic output (measured in gross domestic product), remittances were equivalent to 29.4% of Haiti’s 2016 GDP, while for the Caribbean as a whole, remittances were equal to 8% of GDP – a far higher share than for Central and South America (3.6% and 0.5% respectively). Despite the recent overall decline in remittances, the amount sent by migrants globally to their home countries in 2016 remains more than double that of 2005, when $280 billion in remittances were sent. Global remittances are expected to increase in coming years, because of anticipated growth in the U.S. and European economies (where nearly half of the world’s migrants live), and the appreciation of major currencies like the Russian ruble, according to a World Bank projection. Correction: In a previous version of the graphic “Mexico was the destination for over a third of remittances sent to Latin America and the Caribbean,” the vertical axis was mislabeled. Figures are in billions of dollars.